Golden Week is around the corner, and while it may be tempting to find your way abroad, flights during the holiday are never cheap. Personally, we’re planning a Japan staycation, especially because this event in Osaka is bringing Hawaii straight to Japan. Hotel New Otani Osaka, located three minutes away from JR Osaka Station, is opening its beer garden from Friday, April 28 to July 9. That includes the poolside dining space known as THE TERRACE, which is adopting a Hawaiian theme with an all-you-can-eat Hawaiian buffet with special items from restaurant Hautreelanai. 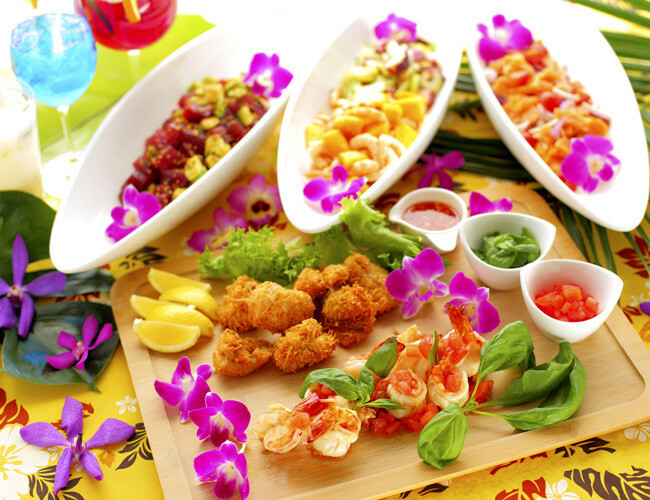 The buffet, complete with free-flowing tropical Hawaiian cocktails, is available for 7,000 yen, and contains mouth-watering dishes like shrimp with lemon garlic butter, BBQ spare rib, hautree locomoco and more. Combine that with the amazing view from THE TERRACE, which overlooks Osaka Castle, and you’ve got yourself a way to get out of Tokyo for Golden Week on the cheap while experiencing the feeling of being in Hawaii.